This book presents the fundamental concepts of assembly language programming and interfacing techniques associated with typical microcontrollers. As part of the second edition's revisions, PIC18F assembly language and C programming are provided in separate sections so that these topics can be covered independent of each other if desired. This extensively updated edition includes a number of fundamental topics. Characteristics and principles common to typical microcontrollers are emphasized. Interfacing techniques associated with a basic microcontroller such as the PIC18F are demonstrated from chip level via examples using the simplest possible devices, such as switches, LEDs, Seven-Segment displays, and the hexadecimal keyboard. In addition, interfacing the PIC18F with other devices such as LCD displays, ADC, and DAC is also included. Furthermore, topics such as CCP (Capture, Compare, PWM) and Serial I/O using C along with simple examples are also provided. 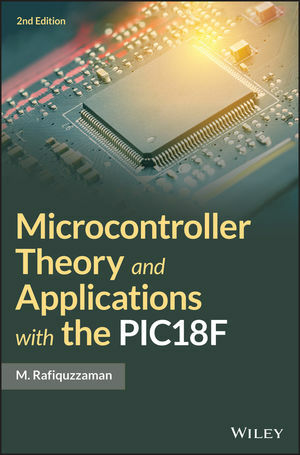 This new edition of Microcontroller Theory and Applications with the PIC18F is excellent as a text for undergraduate level students of electrical/computer engineering and computer science. M. RAFIQUZZAMAN, PhD, PE, is Professor of Electrical and Computer Engineering at California State Polytechnic University, Pomona. Dr. Rafiquzzaman has over 40 years of academic and industrial experiences. He is the founder and President of Rafi Systems, Inc., a manufacturer of biomedical devices (Intraocular lenses) in California. Dr. Rafiquzzaman authored several books on digital logic, microcontrollers, and microprocessors. His first book on microprocessors was published by Wiley in 1982.